Jim Parada saw that CHR defenders Filipo D. Hippo and Kasindak Puslit were arrested in Tondo, Manila. Rather than sit back and be quiet he decided it was time to launch a concert for a cause. It was called "Parada's Concert For Life" which is also called "Concert For a Cause" last March 13, 2017 and planned to do the concert on March 31, 2017 at SM Mall of Asia. "I am launching this concert not only for Leila Dilemma but also for Filipo D. Hippo and Kasindak Puslit who were arrested. I hope that this concert will awaken the minds of Filipinos that the death of EDSA is the death of democracy. I will not rest until President Rodrigo Duterte is unseated from power and democracy is restored. Democracy is by the rule of the Aquino and the Liberal Party. Let's never rest until the Liberal Party is back in power and only they are back in power." said Parada in an interview with Korina Sanchez-Roxas. 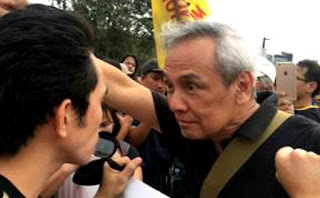 While he planned to launch the concert, his concert organizer Mar Roxas said that while they did sell 5,000 tickets but more than half asked for a refund. Around 4,000 people asked for a refund after the video of him heckling the Duterte Youth at EDSA was replayed. Worse, his interview where he said he was trolled and lied about a lot of stuff caused interest in his concert to die down. "I'm afraid the Filipinos have been brainwashed. We had 30 years of democracy to celebrate but now it died on the 31st. I am so disappointed at how the call for federalism and economic liberalization has destroyed democracy." said concert organizer Mar. Other performers who were expected to appear where Cynthia Patay and Agot Isidro. The concert failed due to a lack of funds. Originally, Mar didn't want to reimburse the tickets but he was soon apprehended by PNP General Bato Dela Rosa and Justice Secretary Vitaliano N. Aguirre Jr. Justice Secretary Aguirre mentioned that it was a scam to start with. PNP General Dela Rosa managed to get refunds for the ticket for Parada's concert. The scammed people were happy to get their money back. Without money from the concert tickets, both Mar and Parada were forced to cancel their concert. "I believe this is a victory for decency. The Duterte Youth should see Parada behind bars for a certain amount of time soon." said Justice Secretary Aguirre. The Justice Secretary and the PNP Chief posed with the Duterte Youth and the people who just had their reimbursement with their ears closed saying, "BALIW KA PARADA!" in front of the news team.